One year ago today as red-shirt (เสือ้แดง) protesters hunkered down behind fearsome looking bamboo and tire barricades blockading about 8 sq.km (3 sq.miles) of the central Bangkok business district, surrounded by heavily armed Royal Thai Army (RTA) (กองทัพบก) troops, one of the protest movements most colorful figures, RTA specialist, Major-General Khattiya Sawatdiphon (ขัตติยะ สวัสดิผล), affectionately known as ‘Seh Daeng เสธ แดง)’ or ‘commander red’ by his legion of admirers died, victim of a single bullet fired from either the nearby Dusit Thani hotel or the building adjacent to it on Rama IV Road. 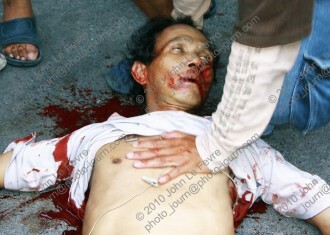 Seh Daeng (เสธ แดง) was shot while giving a media interview directly in front of the Lumphini Park entrance to the Silom MRT station, the light of the video camera illuminating his face for just a few seconds before the sniper’s single round entered his head near the right temple before exiting at a 30 degree angle from the rear, left side of his throat. Tourists at the Dusit Thani hotel at the time claim to have seen what appeared to be a long stick protruding from the hotel’s roof moments before the shooting, which was pulled back immediately after Seh Daeng (เสธ แดง) was shot. Others claim to have seen a person dressed in black and wearing a black hood escorted out of the hotel into a waiting black police van. The same group of people claim RTA soldiers were smiling and shaking each others hands and that they were told by an RTA officer “you have seen nothing, go back to your hotel at once or you will be arrested and deported‚Ä¶ you’ve seen nothing, nothing to see here‚ go back to your hotels”. Originally taken to Hua Chiew Hospital, Seh Daeng was subsequently transferred to the Wachira Hospital where he was pronounced dead at 9.20am on May 17, 2010. 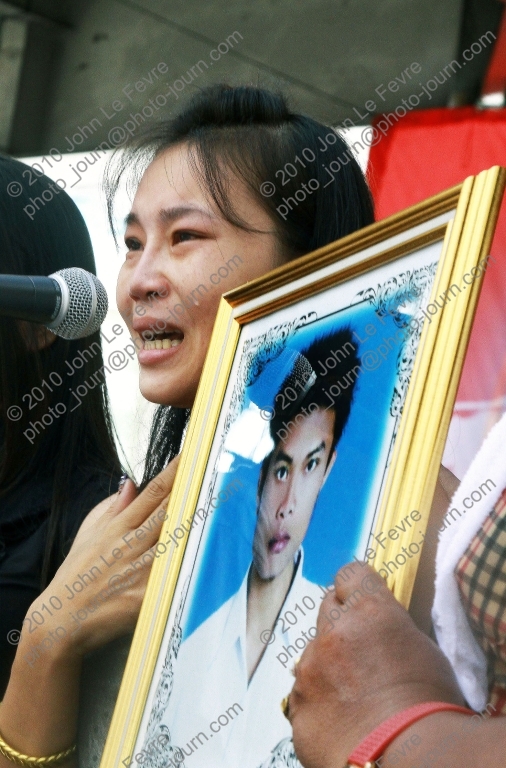 One year after the lone sniper’s bullet was fired Seh Daeng’s daughter, Khattiyaa Sawasdipol, along with the legions of red-shirt supporters who viewed him as a larger-than-life folk-hero, are still waiting for answers as to who fired the fatal shot that killed Seh Daeng . Also waiting for answers are the families and friends of the more than 90 red-shirt protesters killed and those of Japanese cameraman Hiro Muramoto and Italian photo-journalist Fabio Polenghi. At the same time the widow of Colonel Romklao “Pee Pao” Thuwatham (ร่มเกล้า ธุวธรรม), the highly respected deputy chief of staff of the Prachin Buri-based 2nd Infantry Division who was killed in a battle with red-shirt protesters at Khok Wua intersection on April 10, 2010 and the families of more than a dozen RTA troops killed over the two months are also still searching for closure. With parliament now dissolved ahead of next month’s general election the much promised open and transparent investigation and various committees and inquiries set-up in the wake of last year’s protests, including the Truth for Reconciliation Commission, have failed to identifying a single perpetrator for the more than 90 killings that took place last April and May. In a country where getting to the truth is more evasive than the centuries-old search for the Lost Ark of the Covenant the deaths have been pushed aside like rice hulls on the milling room floor, with neither the Democrats or opposition Pheu Thai Party (PTP) pursuing the matter, lest the topic open festering wounds and disenfranchise even the smallest number of people resulting in lost votes on polling day. 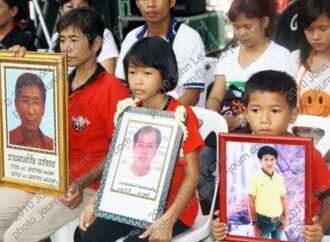 Irrespective of whether one is a supporter or opponent of the red-shirt movement, the families and friends of those killed on the streets of Bangkok in 2010 deserve an explanation, with the guilty from both sides deserve to be brought to account. That men dressed in military uniform were seen on rooftops in areas under the control of the RTA sniping at the red-shirt protesters is irrefutable ‚Äì this correspondent having seen several unarmed protesters killed ‚Äì the majority shot in the head ‚Äì by silenced rounds that could only have come from the RTA controlled positions. At one point I felt the wind of a bullet (later recovered) jet past my face, while on another occasion bullets fired by troops in an armored personal carrier on the Rama IV flyover struck the ground less than a meter from my feet. 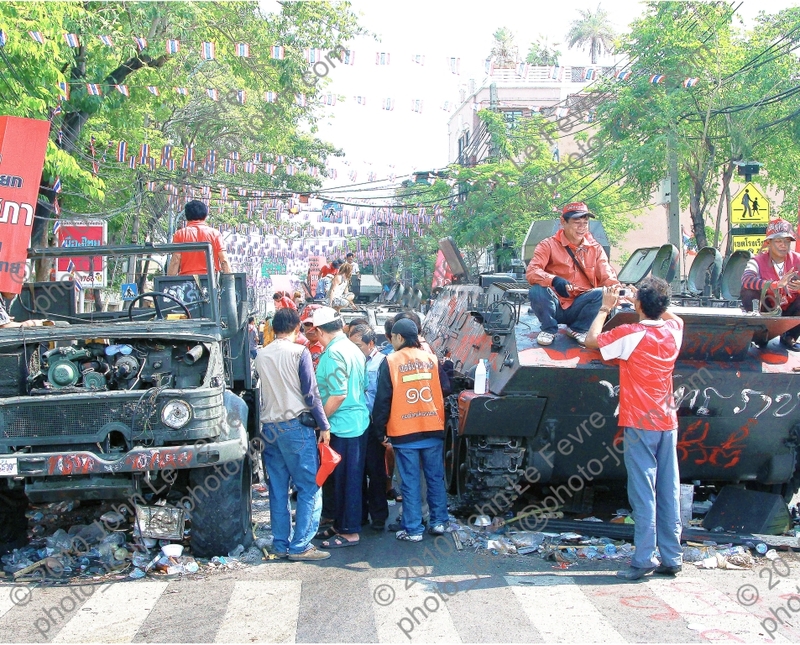 What is equally irrefutable is that the the red-shirt encampment was heavily infiltrated in the weeks leading up to the final, bloody crackdown on May 19 by RTA and Royal Thai Air Force (RTAF) special forces troops posing as journalists, photographers and videographers, all displaying the mauve domestic journalist media pass and the distinctive green armband of the Thai Journalist Association. 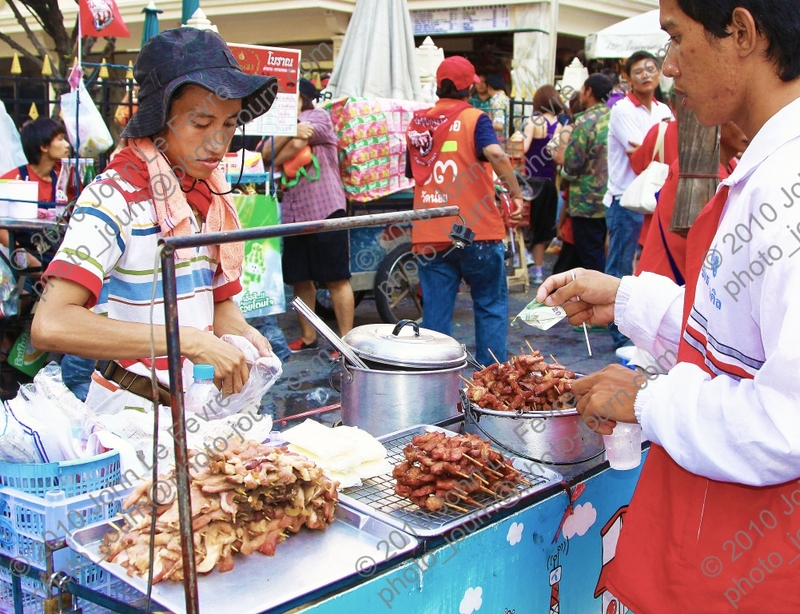 One very well placed source who spoke on the condition of anonymity said the level of infiltration by Thailand special forces was such that noodle carts, food vendors and even concessions selling red-shirt clothing, hand-clappers, and DVDs were also staffed by RTA undercover operatives, who used their prime positions to photograph and video virtually every aspect of the protest. 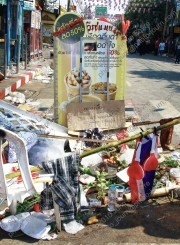 According to the informant, this not only occurred at the main red-shirt stage at Ratchaprasong, but also in other areas where protesters gathered, including at Ding Daeng and Bon Kai, leading to speculation that the government may be in possession of video footage and/ or still images capturing the deaths of many red-shirt protesters, as well as that of Mr. Polenghi and possibly even Mr. Muramoto. The informant said it also defies belief that given the level of infiltration the Thailand government and/ or RTA is not in possession of video showing those responsible for setting alight the Central World shopping mall and other buildings following the surrender of red-shirt leaders. 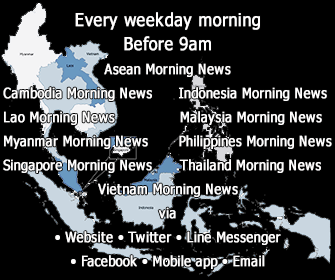 Video released by the Thailand Government has only used publicly available clips. Despite allegedly being in possession of hundreds, if not thousands, of hours of video and still images, the Democrat-led government of Prime Minister Abhisit Vejjajiva (อภิสิทธิ์ เวชชาชีวะ) has so far failed to make public a single image or minute of video footage, even to the various committees set up in the wake of the protests. One video clip hastily clubbed together for the Thailand Government’s Factreport website by the Centre for the Resolution of the Emergency Situation (Cres) uses entirely public domain footage, while those on the Centre for the Administration of Peace and Order (Capo) website are all pulled from the video sharing website YouTube. When asked why the Thailand Government and/ or RTA might be reluctant to release video and photographs taken by undercover special forces troops, especially if they supported the Government’s claim the red-shirts were armed terrorists, the informant said doing so would open a Pandora’s box. “if the government admitted to having some secretly obtained video and photographs the question would always be how much they really have, and what it actually shows. Some of it would support the Government’s claims, but others might not and there would always be a question as to whether it had all been released or not”, the informant said. Late last month Seh Daeng’s daughter wrote to Prime Minister Abhisit asking why there is no answer to the lingering question of who killed Seh Daeng, while in a Bangkok Post article published on the anniversary of Col Romklao’s death, the¬†paper focused entirely on the grief of the family and other military and police members killed last year, totally ignoring the fate of those killed on the red-shirt side. Though the families of government security forces killed during the protest continue to be looked after financially, the few thousand baht handed out to the families of dead and injured protesters and others by the opposition PTP and the Royal Household Bureau have long since been spent. Until the Thailand government and the RTA release publicly all of the video footage taken by its undercover operatives during the protests last year, and until PTP puts the interests of ordinary Thais who turned out in the hundreds of thousands to support it and it’s leader, deposed fugitive former prime minister Thaksin Shinawatra, above that of parliamentary seats, the millennial-long search for the Lost Ark is more more likely to bear results than finding the answer to who killed Major-General Khattiya “Seh Daeng” Sawatdiphon, Colonel Romklao “Pee Pao” Thuwatham, Hiro Muramoto, Fabio Polenghi and at least 90 other people on the streets of Bangkok in 2010. Was Seh Daeng killed by a disgraced former Thai army officer? Until that happens, stories such as the one told to this correspondent last year while Seh Daeng lay in a coma in Wachira Hospital as to who fired the fatal shot will continue to circulate and grow in popularity. The story told by a PTP official who spoke on the condition of anonymity, was that Seh Daeng was killed by a homosexual former RTA officer that Seh Daeng had outed for seducing a friend of his, resulting in the officer involved being expelled from the RTA. “You have to remember, the Thai Army is very macho and homosexuality is something that is particularly frowned upon. Seh Daeng was furious that this person had seduced one of his friends and he made a big issue out of it, calling out the officer in question and resulting in his expulsion”. 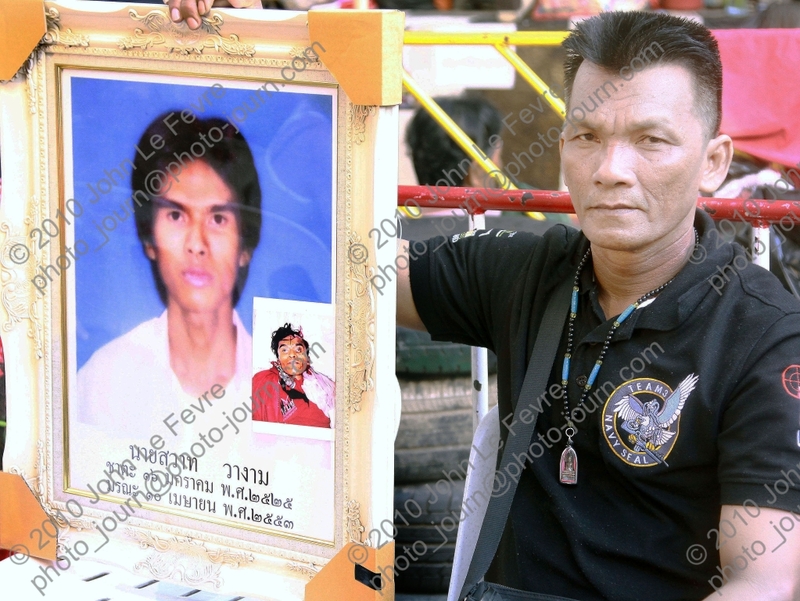 According to the PTP official, classmates of Col. Romklao were incensed at Seh Daeng bragging and boasting that his “Ronin warriors” were responsible for the respected military officer’s death and while they didn’t believe the claims, found them to be particularly offensive and an insult to the entire class. The dead colonel’s classmates, graduates of Chulachomklao Royal Military Academy‚Äôs Class 36, used the various resources at their disposal to obtain the weapon, ammunition and friends to provide the disgraced former military officer with the ability to settle the score, which the person concerned readily agreed to. Whether this story is true or not will most likely never be proved, while the truth may be somewhat more mundane and boring than this and Seh Daeng was just the first on a list of red-shirt leaders that special forces troops had been dispatched to take-out prior to the crackdown on May 19. That 58-year-old Seh Daeng had no shortage of enemies is also not in dispute. 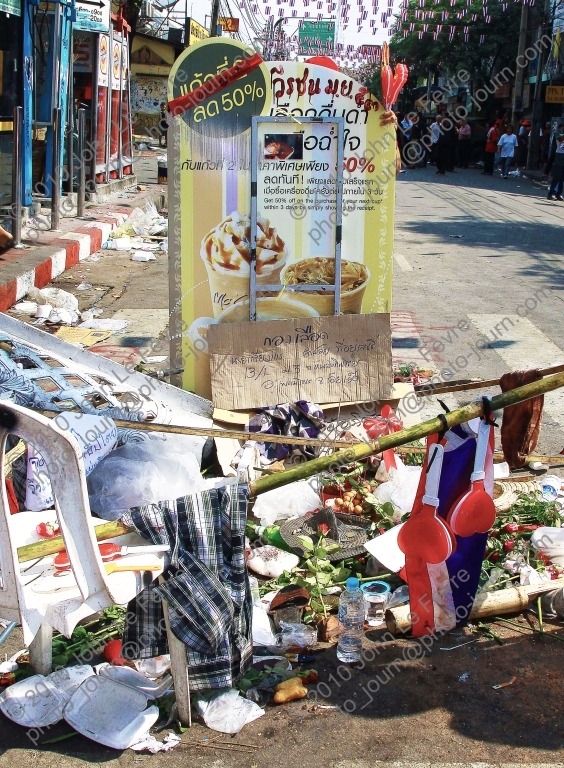 Amongst his known enemies was former national police chief Sant Sarutanont who Seh Daeng had a public spat with in 2003 over land ownership when hundreds of men trashed a bar near Sukhumvit Soi 10. Seh Daeng accused Sant of helping police who commanded the men during the skirmish and when he lost a lawsuit filed against him by Sant in 2006, he declared himself bankrupt rather than pay the Bt20 million ($US660,000*) reparation ordered. He was also involved in a very public altercation with Thailand police commander General Seripisut “Seri” Temiyavet, that saw Seri file a libel suit against Khattiya, resulting in him being jailed for four months, with Khattiya subsequently filing a Bt600 million ($US19.8 million*) defamation suit against Seri. 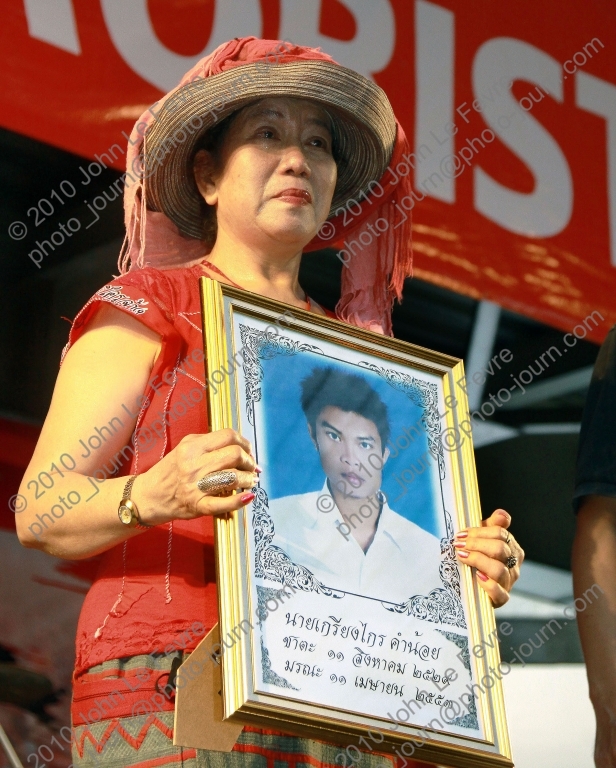 In 2008 Khattiya was suspended from duty for visiting deposed fugitive former prime minister Thaksin Shinawatra overseas without permission and later criticized army commander General Anupong Paochinda for failing to take action against the People’s Alliance for Democracy (PAD) for seizing both Bangkok airports and Government House. When Anupong reassigned Seh Daeng to teach aerobics at shopping centers he is reported to have phoned the army chief and said, “are you crazy? I’m a warrior, not an aerobics instructor!”. However, rather than humiliated and embarrassed, the sight of the burly soldier in skin-tight leotards won him a huge female following. 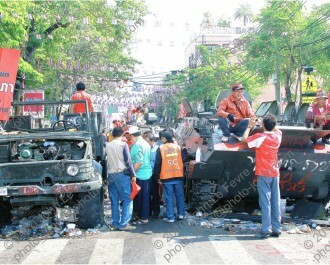 In January 2010 Khattiya was suspended again after an inquiry found he had supported the Democratic Alliance against Dictatorship (DAAD), a political group aligned with the red-shirt movement and the next day rocket propelled grenades peppered the ante-room adjacent to the office of the Thai Army commander causing significant damage to the building, but no injuries. A self-confessed aficionado of the 1995 movie Braveheart, Seh Daeng was often quoted as saying he was the Braveheart of Thailand. Just as William Wallace in 13th century England never lived to see the freedom he fought for, neither did Seh Daeng, though it is yet to be seen whether his loyal band of red-shirt followers will have to wait as long as the Scott’s did after the death of Wallace to gain the freedoms they crave. Footnote: *Foreign currency figures are based on rates applicable at time of writing. 2 Responses to "Who killed Seh Daeng?" I’m very sorry about that. I took a freeze frame off a Youtube posted video titled “tribute” which I downloaded and found to also contain quite a few of my images also. I can remove the image if you wish. In the meantime I’ve applied correct accreditation and a follow link back to your website. Apologies again… Great photo by the way.